If you haven’t heard of Gypsii yet I can’t imagine where you’ve been for the last year. 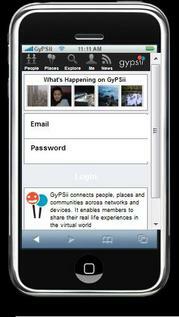 Considering I’m sure you’re an avid fan of Twitter, Facebook (and possibly also a MySpace user) Gypsii, is the social networking app that not only lets you share your thoughts easily, but also your images. You may ask why you wouldn’t just use Twitpic or a similar uploader to do this, but where Gypsii has the edge is that it geotags all your pics, uploads them, and then lets you search similar destinations in that area. You can read up to the minute user reviews and comment on them, thus creating actual friends who you might even connect with IRL (in real life). Previously Gypsii was accessible from your home computer or certain handsets, where once logged in you had the option to search, browse and upload but now you can do all of this whilst on the move. You could almost consider GyPSii as a mobile diary, as the snaps you take document the travels of your day. The recommendations feature is a useful tool as you can let people know how high (or low) you rate certain restaurants and activities, and you can even feed you GyPsii account into your Facebook page for updates across all your networks. The launch of GyPSii on the iPhone platform should be well received, as since Samsung, Nokia, LG, and Blackberry were already in the game, the iPhone has been last to this table (for once). They’ve changed the interface slightly though, as they’ve used the feedback off their apps on other phones to fully customize the experience. If you’re a snap happy person who likes to record every single event this will be an app to get you very excited, if not then you may find it slightly too much over-sharing. You also have to consider the drain on battery life if you’re using the app constantly, but if you use it casually, it doesn’t seem to affect the battery that badly. MSI get ultra slim with the X340 notebook: Should the MacBook Air start cowering? I’m happy to have found your very excellent article! I agree with some of your readers and will eagerly look forward to your coming updates. Now this world changed.Every things went on Google Map or other map agency. website.This excellent very informative ..